Publication or other use of images or descriptive text on these pages is unauthorised unless written permission is obtained from the authors and publisher. Appropriate acknowledgement of the publication Common Weeds of New Zealand must always be given. Wholly-submerged, free-floating or lightly anchored, rootless, delicate aquatic perennial. Has forked, finely divided leaves. Forms very dense under-water masses of vegetation in freshwater up to 10 m deep. Flowers Green (female), whitish (male), no petals, minute. Solitary in leaf axils, stalkless, with ten to twenty stamens, adapted for underwater pollination. Fruit Black oval nuts 5 mm long, with one terminal and two basal spines. Leaves Dark green, up to 4 cm long, in whorls of seven to twelve densely crowded at the stem apex and increasingly spaced down stems. Leaves equally forked once or twice into rather stiff, tapering segments. Stems Floating, submerged, up to 1.5 m long, branched, stiff and rather brittle. Readily broken by waves, current or boats to float away and establish in shallow water. Roots No roots, lightly anchored in sediment by buried leaves and stems. Still or slow-flowing freshwater of lakes, lagoons, ponds, rivers and drains. Locally abundant in the Waikato River system including hydro lakes. Common in Auckland, Waikato, Rotorua Lakes, Taupo, Hawkes Bay and Wellington in NI. Found throughout the world. 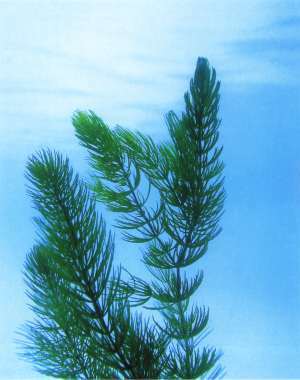 May be confused with parrot's feather (Myriophyllum aquaticum) which has pinnate, rather than forked leaves. Listed on the National Pest Plant Accord (see Introduction for details). Ceratophyllum (Gr.) = horned leaved, the leaves resembling antlers; demersum (Lat.) = submerged. Weedbusters is a weeds awareness and education programme that aims to protect New Zealand's environment from the increasing weed problem. A free tool to assist farmers and agricultural professionals in decision-making regarding weed and pest identification, biology, impact and management. An interactive identification key to the weeds of New Zealand. Developed at Landcare Research. Search for information on more than 2500 naturalise and weedy plants. Their main objective: "To pool and exchange information on the biology of weeds, invertebrate and vertebrate pests, pathogens and beneficial organisms and methods for modifying their effects." A site providing information about New Zealand weeds and weed control. 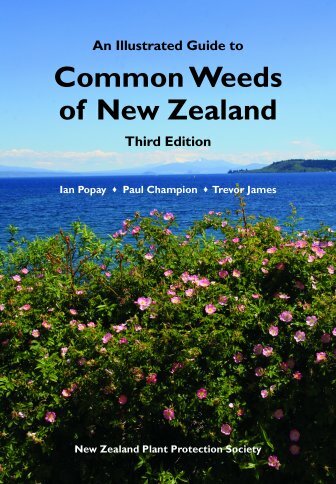 It has a series of pages showing pictures of New Zealand weeds, notes on identification and control. It also provides information on a university paper entitled Controlling Weeds. Weeds website of the Australian Government. Promoting wider awareness and interest in weeds and their management. Includes a useful page of links to other weed societies. Listing of common and botanical names, images, and information including control methods for weeds found in Tasmania, and also weeds of national significance. Images and other information from the University of Georgia. Weed-related resources including weed science, practical tools, gardening tips about controlling weeds, and environmental news updates. "The ISSG aims to reduce threats to natural ecosystems and the native species they contain by increasing awareness of invasive alien species, and of ways to prevent, control or eradicate them." Site that includes a comprehensive collection of weed images from around the world.